- Heroselect, a program that will allow you to swap out characters (as there is a hardcoded maximum limit of 27 characters in-game). 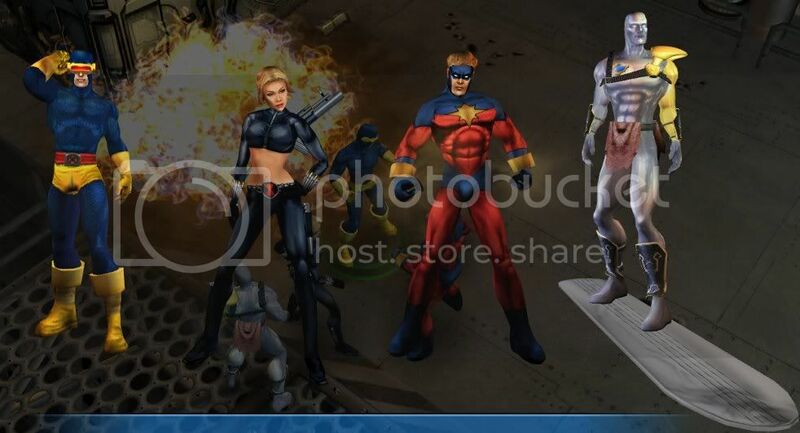 Captain Marvel, Hawkeye, Hulk and Moon Knight come pre-installed. Use Heroselect to swap them out if you wish. IT IS RECOMMENDED TO DO A CLEAN INSTALLATION OF THE MOD! 7z Archive: Click on the picture to download. 1. Back up your files - the mod overwrites many important game files, including herostat. It will also reset your heroselect to include only the officials, so you will have to manually add other characters to heroselect. 3b. If you are using the English version of the game, right click on OfficialChars_1.3.7z and click "Extract Here". 4. If it asks you to "confirm file replace", click "Yes to all", assuming that you have backed up your files already. If you haven't backed up your files, then click "No to all" and back up your files now. 5. Wait for it to unpack. 6a. If you are using a localized version of MUA (e.g. Italian), restore the files you backed up during step 3a. 6b. The mod is now ready. Some changes might not work correctly until you start a new game. 7. The default herostat contains Captain Marvel, Hawkeye, Hulk and Moon Knight. You can swap in other characters with Heroselect or use NRCompiler to manually decompile the herostat.engb file, open it in a text editor, change your desired characters and recompile the text file back into herostat.engb. You can find NRCompiler along with the herostat entries of other "Official" characters in herostat.CFG in the "heroselect" folder. - Some comic book mission discs will reappear in-game after being collected. This is caused by limitations of the game engine. There are no known negative side effects of this problem. - Some unique conversations may not work in localized (non-English) versions of the game. For details see "Notes on unique conversations" at the end of the "Official Characters Readme.txt" file . amaaazing! can't wait to play! thanks Dark_Mark!!!! I just feel like a kid again! Awesome! Very, very nice job! Installer will follow this week. the wii models look amazing! cant wait! nice work everyone! I have a problem with heroselect. When I have selected which characters I want and press Accept Team, this opens up: http://img523.imageshack.us/img523/1253/35589415.png and then when I start the game the default characters are still there. does heroselsect support it? i know nova had problems, but it may be isolated.